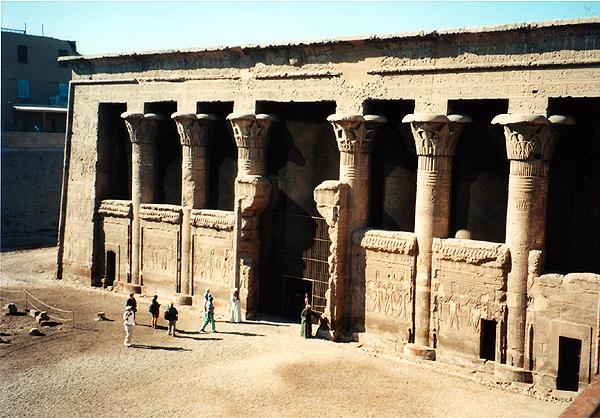 The Late Roman temple of Khnum at Esna dates from the rulers Ptolemy VI (180-145 BC) to Decius (249-251 AD). 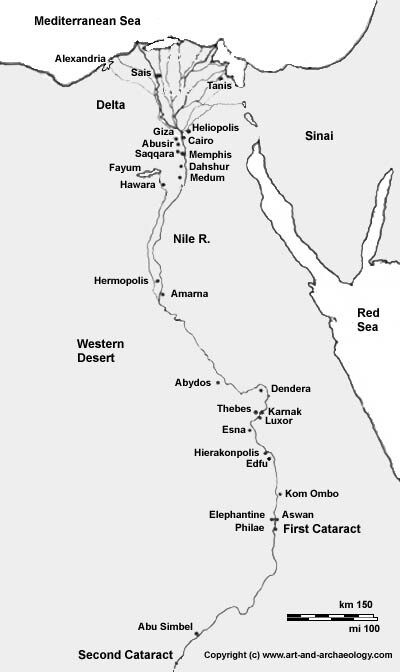 It is located just off the Nile, about 30 miles south of the Valley of the Kings (map). This photo is taken from ground level. It shows the hypostyle hall, built during the reign of Claudius (41-54 AD), nestled in its large and deep excavation pit. Contemporary ground level, built up by siltation from the Nile and by the debris from two thousand years of continuous human occupation, is indicated by the retaining wall and buildings at the far left. The rest of the temple has not been excavated, and remains buried 30 feet below the modern village. The temple contains two large inscriptions in praise of Khnum, a ram-headed creator god who fashioned mankind on a potter's wheel from the clay mud of the Nile. One inscription is written using mostly the crocodile hieroglyph, the other using the ram. These demonstrate the high level of cultural sophistication maintained by Egypt during the period of Roman rule, as well as, perhaps, a deliberate obscurantism on the part of the Egyptian priesthood vis-a-vis their Roman overlords.